The Book of Lambspring is generally interpreted to describe a process of laboratory alchemy, yet its descriptions show a striking parallel with inner work as well. Alchemy has oftentimes been seen as a discipline primarily, if not exclusively, with descriptions of laboratory work. One would think it odd then, in this vanity, that a work associated with alchemical symbolism so clearly would contain evidence of the 'inner work'. I do not reject the notion that this work is an encryption to a sequence of lab-work, for one can easily lift out various points to justify such a claim. For sake of an example, "Figure II" can be argued to point to making of the Regulus where a certain sulfide ore, symbolized by the scaly dragon, is subdued by iron, symbolized by the sword. I will purposefully omit various aspects and details of this work that are best left unsaid. It's not an authoritative reflection, truthfully, not meant to be one. The full explanation of each image could easily reach long volumes of writing. This reflection is an earnest effort to highlight the reality that alchemy is much more than chemical manipulation and that our brothers of old also knew this important insight. Now, about the work at hand: there're more than one version available, depicting various details slightly differently. I will bring out some slight variations, but in the overall sequence of initiation it matters very, very little to the meaning. I make no excuses to point out, my service to this work is not linguistic. I will let others with greater knowledge than I tackle that part of this work. Mr. Adam McLean has published such an attempt for the English speaking world. And I am grateful to his great service for I use some parts of the text where my interpretation of an image would be a far stretch to understand without a text (for those who have not undergone initiation). What may be important to observe here is the opposing currents of movement. This reality creates naturally what can be referred to as a 'tension of opposites'. The two fishes do not swim away from each other; they directly create ripples upon the fabric of the river. This philosophical notion contained in this imagery is not particularly unique or surprising. As far back as Plato, philosophers of renown have described the world of duality. Physicists of today similarly maintain the principle that a wave-particle duality exists in microphysics. It speaks plainly here to the fact that all initiates are within a binary system. In other words, the river is an undefinable container. Jungians would refer to this state as the unconscious. The previous quote referring to the fishes "without any flesh or bones" simply means a state of unmanifested potential. The sailing vessel, let us call it a boat or a ship, has a specific purpose in mind. It was invented as it was made to harness a freely available form of energy. In this frame of mind, while seemingly an insignificant detail, this work is purposefully using the symbolism of a sailboat as opposed to a canoe, or a piece of log or even a man swimming. The energy of the wind can certainly be an influence. Some of the locomotion of the sailboat will indeed occur naturally by the current of the river. Yet this is a slow process compared to the output of the wind's power. In this detail, we see the distinction made by this work between the mindset of the uninitiated and of the initiated. The [spiritual] progress in the initiated is said to be accelerated in comparison to the uninitiated. To use the analogy given here, the initiated recognizes this form of energy (viz., hidden influence) by consciously engaging in the process of initiation the same way as the captain of his ship uses the focussed sails to propel the vessel forward. The ship itself, as is the ego, is only there for the ride. In other words, the spiritual journey that can be initiated to deeper insights appears to remain unavailable for those who do not know the closely guarded secret. Or, also, to those ships (initiates) who are depicted as parking at the shipyard, meaning they resist change. On the right side of the shore, we're shown a small town and shipyard. As a man-made structure, the town symbolizes a learned system, an intelligently organized and designed function. This is representative of the tool that all uninitiated have available: the mind's intellect. On the opposite side of the shore, we find a symbolic depiction of the wild, uncharted, unknown territory yet to be experienced. And while to the frustration of the uninitiated, for the moment at least, it's beyond the grasp of the intellect. Another point to draw attention to is the depiction of other ships on the river (of life) extending upon a curvy path. Needing little interpretation here to say, no initiate is ever the first nor the last to embark on the path of illumination. In the binary system, duality by definition brings about opposing forces. Here we have a full-sized dragon and an armoured soldier with sword-in-hand. For those familiar with Christian hagiographies, the dragon pierced on horseback by Saint George also comes to mind. This dragon is the guardian of the binary system. (Psychologists will no doubt see this dragon as an unredeemed aspect of humanity.) It's a real force emerging out of a lesson that all initiates will one day need to solve if they're to succeed. 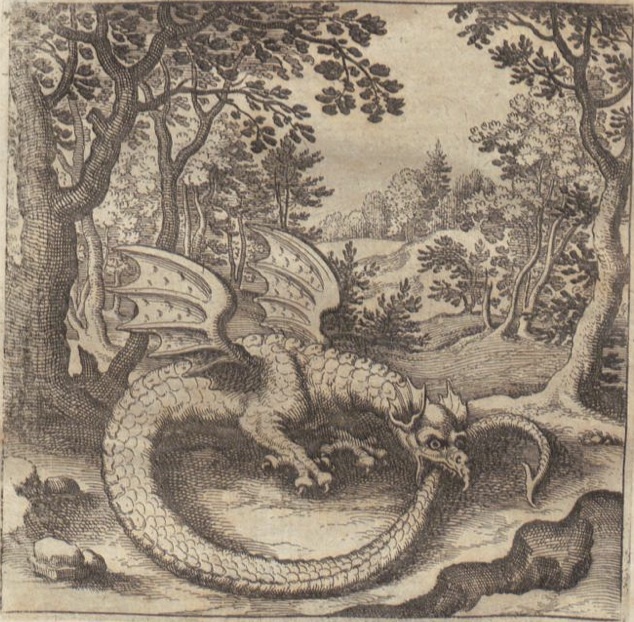 Jungians have traditionally labelled this dragon as something universally present in the human psyche. They even gave it an unforgettable name which I shall vow silence over but any researcher will find it, if the will is there to look. 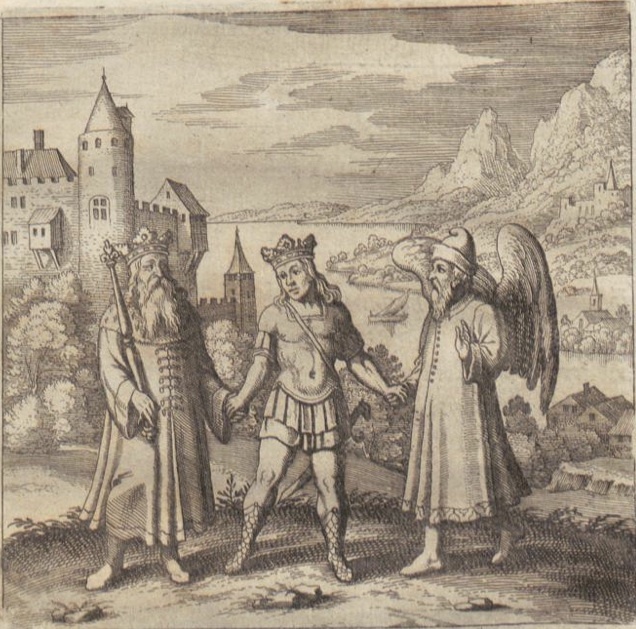 The symbol of the sword has gained notoriety in occult literatures, alchemy is no exception. Let us just say that here we'll see this as the inner fire of purification, energy, or in terms of physics, as frequency. In other words, initiation is not an intellectual pursuit but a very real shift of energetic transformation. And we would go so far as to say, a shift of frequency as physics would have it. I will say no more on this significant detail other than to encourage the reader if he (or she) wishes to do so to research this notion. 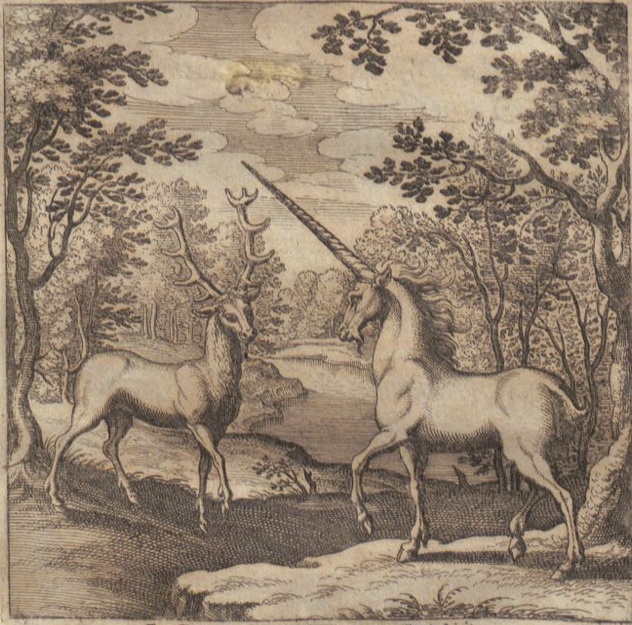 Off onto the left shore, continuing with the wilderness theme here, are depicted two four-legged land creatures: a stag and a unicorn. I will say firstly that this scene is showing yet another element of the world of initiation. I will quote several sections from the accompanying English text to provide more illumination before I state the purpose of this image to the overall work. We have an answer here as to why the initiate (viz., consciousness, focussed awareness) has been guided into the unknown instead of into the township (known as intellect). For the unknown is the rightful place of both of these creatures. Clearly, we're dealing with a notion here that says that the unknown, unconscious, is full of vital information. So the initiate who captures this wisdom will be "happy". This simply referring to the fact that this focussed awareness is worthwhile to pursue. This description clearly shows that we're not communicating about "animals" but about a phenomena or depiction of reality that speaks to its very nature and also validates the law of Hermeticism, that all is one. If what was said above holds truth, then what are we to make of the symbols that these particular animals were chosen to represent? If we examine the nature of a stag, its antlers regularly drop and grow as part of its nature. In this sense, as well as the antler's visual prominence, it is not far reaching to say that the stag represents the Tree of Life. But a stag by nature also calls for fecundity as well as rhythm of growth and rebirth; and we may then come to agree that the last two qualities are what best exemplifies initiation. Well historians, if we are to trust them, tell us that the unicorn has traditionally symbolized power. This comes to be regarded from the long, protruding horn not unlike that of our initiate's sword. However, while the sword is an addition to the armoury of the knight, the unicorn's horn grows out of its head, naturally. In other words, the power this animal symbolizes is an inborn, inner strength. So we're dealing with a description of what the initiate will need to climb the Tree of Life and experience rebirth: simply put, unwavering commitment (inner strength). 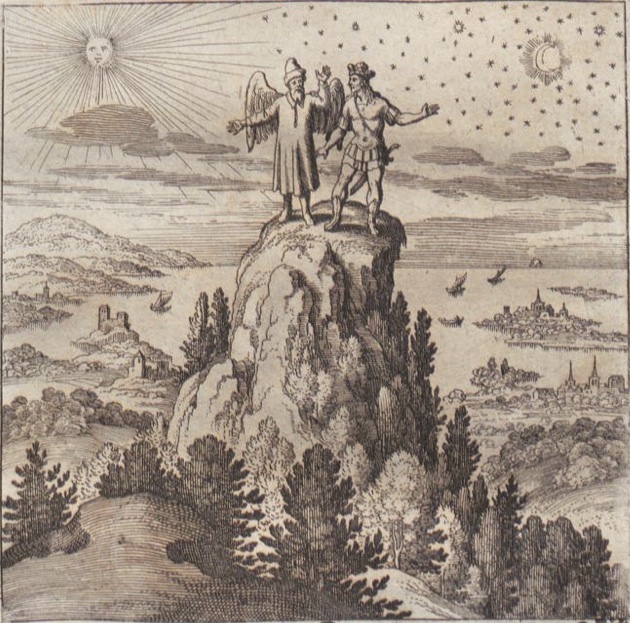 This particular symbolism is probably the most recognized image in alchemy, although in slightly different fashion than here in the Book of Lambspring. We're shown a male lion and a female lioness. Embracing each other. Walking away from the river (depicted in the background). Both travelling the same direction. Meaning there isn't any conflict here. Can you guess what popular alchemical icon this is depicting? If you said the King and Queen of nature, you are right. If you said, the infamous Rebis, then you're right as well. The androgynous symbol is well known in alchemy circles. A stream of masculine and feminine aspects integrated into one whole being. 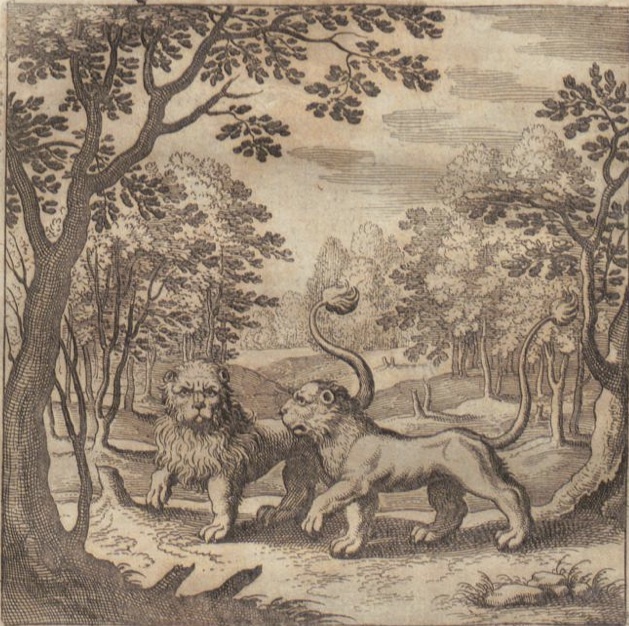 While in this instance we have two separate animals, the key lies in the same nature, represented by both being lions. This particular stage in initiation is indicative of a successful ending to the battle between the dragon and the sword-wielding initiate. 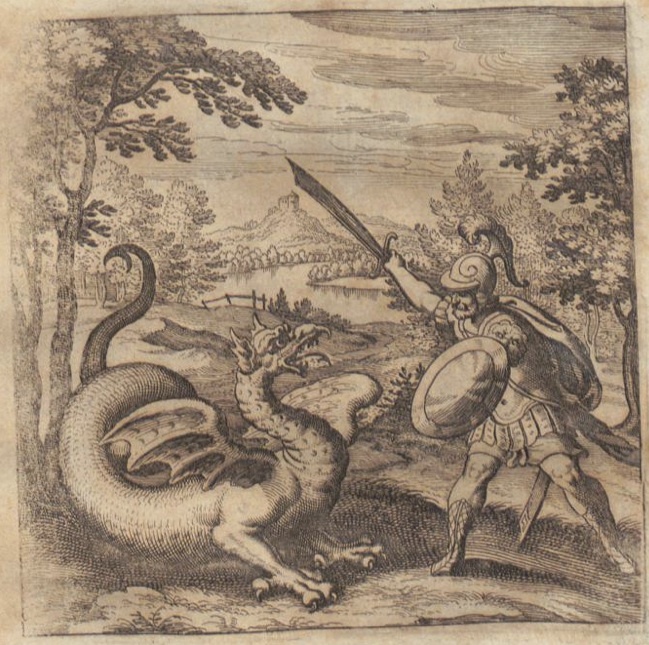 In Basil Valentine's, “Theatrum Chemicum,” the hermaphrodite successfully stands upon a fiery dragon which gives strength to the concept depicted here. In other words, one can also confidently interpret that this image speaks of achieving a balance between the two streams of consciousness within the initiate: masculine and feminine. Neither having more authority over the other. A bridge in the background is connecting two sides, the two landmasses, that the river otherwise would keep separate. (The two sides being the unknown and the intellect.) What this generally refers to is that with the help of initiatory experience, our intellect is now able to make deep connections. This we have referred to as illumination. The "poison" that this text alludes to is perceived by the initiate, undergoing initiation, as death (of identity). The word “initiation” shares in the meaning of the Greek word, “teleutan”: to die, to put to death, not in a literal sense but rather as a crossing of a threshold to another life. A sort of gateway, one could say. This metamorphosis represents a death to the mundane world where previously held things of importance fall away. During our method of initiation, such experiences can turn away an initiate and also can potentially expose him to mental breakdowns and even to psychosis. That's why we hold initiation as a sacred undertaking, meant only for those students who are seriously committed. The wild wolf [i.e. 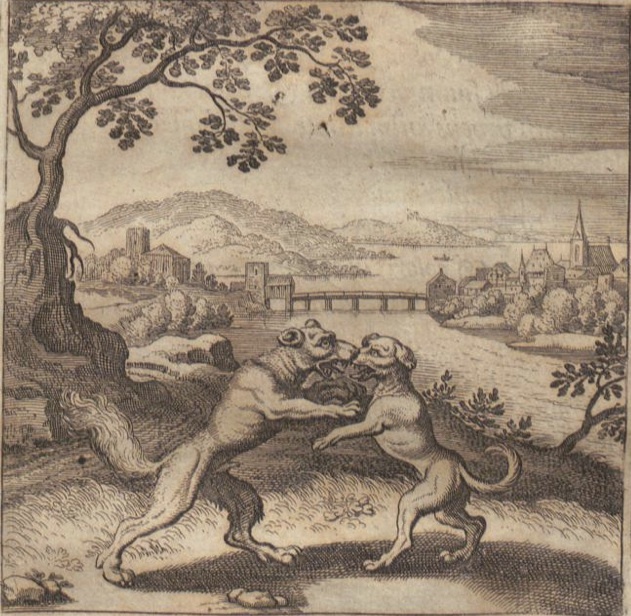 the unknown] depicted as slightly larger than the domesticated dog [i.e. the intellect] may also hold a clue into the fact that regardless of the great power of our intellect, when it comes to the journey, the unknown aspect of the journey always seems more powerful. This sets up an interesting dynamic that requires the initiate to either surrender to the guidance of an experienced Guide or perish, figuratively, from absolute confusion. Within the alchemical tradition if there was a symbol that has found its way into more works than any other, then this particular one, that of the ouroboros is surely it. Before us a winged dragon, biting his own tail, firmly rests. No other animal or humanoid elements are present. We also learn something contrary when compared to Figure II where the dragon was represented as an adversary. 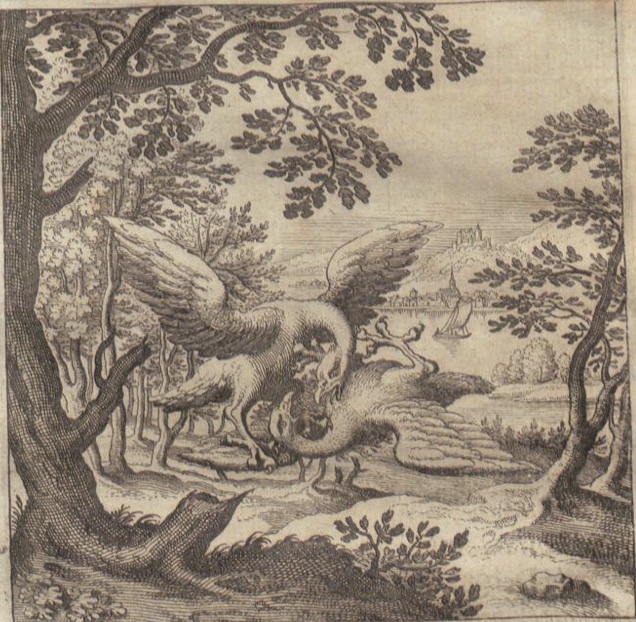 Here this same winged dragon appears to be engulfed by its own act. To uncover the secret held here, I will refer to van Helmont's observation: "This serpent has bitten itself, recovered from the venom, and henceforth cannot die" (Imago fermenti, p. 72). In the previous Figure V, we learned that a great battle ensued culminating in a "poison". It was experienced upon an unknown territory. Meaning, initiation is a process that cannot be had without revelation based on personal experiences. To say it another way, one cannot possibly figure it (the journey) out in advance. Any inner battle, regardless of its severity, only testifies to the fact that it isn't brought yet to harmony. It also speaks to the call for surrender. The initiate knowingly took the possible poison by continuing with the journey and has come to realize that the death wasn't as one previously feared. So what does this dragon mean in this context of the journey? It signifies the solution to the enigma that plagues many initiates: how to defeat the dragon? And how not get completely confused or become discouraged by the journey of initiation. We're shown a specific spot on a mountain side higher in elevation. There stands rooted firmly a tree. On one of its branches sits a nest. This leads us to conclude that whatever was gained earlier in the conquest of our self, brought the current scene to higher ground (higher knowledge). It is depicting the notion that initiation is a spiritual evolution. Yet the image shows that it is also nowhere near its completion. And will not let it get away from the nest. I will confess here that this image was the first symbol that earned a distinguishing quality, in my mind at least, from other works on the spiritual journey. You see, a majority of spiritual disciplines appear to promote systems that advocate an act or instance of running away from our problems. Escapism, in general. Yet in this image one finds the lesson that regardless of what be our spiritual intent, one also needs to be grounded in daily, terrestrial, mundane life. What would be the point of initiation if it wasn't also to prepare the initiate how to live fully prepared for the terrestrial life? How would one carry out our spiritual purpose if one wasn't a master of our terrestrial affairs? And this intimate connection between the above and the below is evident, regardless of whether one is on higher ground, as depicted by the nest on this tree. We're also introduced to a link in this particular Figure VII to an earlier one, Figure III. Specifically to the symbolism brought about by the stag (deer). We learned that the notion of the Tree of Life is significant to this work. Here again in Figure VII we see mention of it in the form of a bird leaving a terrestrial nest yet having to return, for the link between Heaven and Earth is "bond of wedlock". The tree (of knowledge) here seems to take on notions as that of the symbol of the stag. It wouldn't be far reaching to say that it speaks to the fact that spiritual knowledge must be brought down into terrestrial life. On the periphery, we have several details here that are as significant as the action unfolding at the center is. A sail ship is drawn on the river. This common background reference simply says to the reader, take note, this action scene deals with an attribute of the initiate. Right of the river, clearly visible, is a town. At the edge of the image we have a tree close up and, if one looks carefully, you'll see three branches broken off. Superficially, without getting into much detail here, this is a reference to the fact that this 'attribute' takes many tries and attempts for the initiate to overcome – for example, three attempts being depicted here. 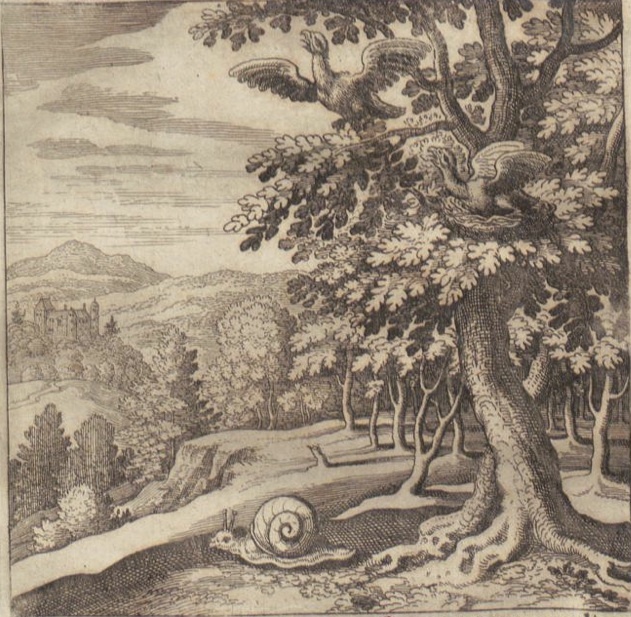 The tree is obviously symbolic of an earlier image, the stag (Tree of Life). The main action is at the center, upon the land of the wilderness, the unexplored territory. Two birds are wrestling on the ground. One from the top, looking down. The other in submissive position, from the bottom looking up. This Figure VIII is forever linked with the previously established notion presented in Figure VII. In many instances, there’s a battle between our spiritual purpose (viz. above) and with that of our terrestrial needs (viz. below). Then both are changed into white doves, explains the text. In this way, by following our spiritual purpose, both the mundane and the spiritual achieves "a more glorious life". In other words, both benefit. Our attention, firstly, should focus upon the stone bridge (in the distance) connecting the left and right sides of the two land masses. Both sides of the river are now populated with townships of buildings. 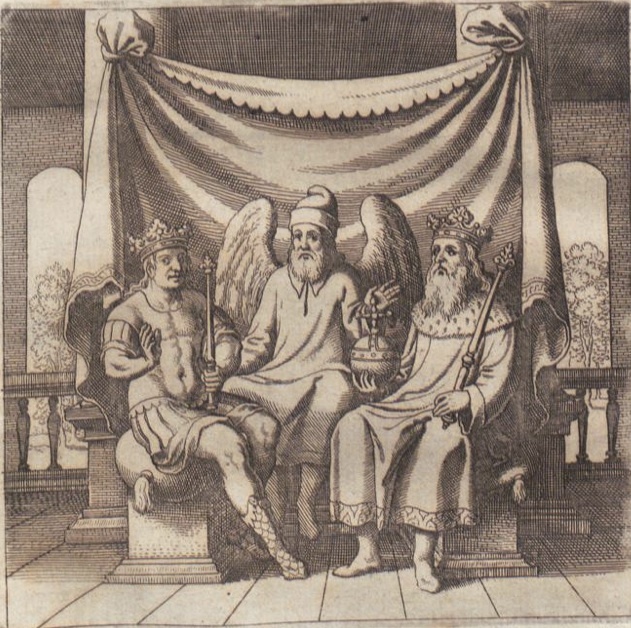 Our king now sits on his throne held up by three visible pillars; a fourth pillar to the king’s right and rear that is probably there also yet may not be entirely ‘visible’ in this image, it does appear to be hinted at. The stone palace encapsulating the royal throne also exhibits the same architectural curve as that of the bridge over the river. Seven stone steps leading up to the throne. If we're to count the previous seven images, we would get a clear picture of the wisdom each one attributed to the seven steps of the journey so far. The first image, Figure I, not included for that particular one merely explains the binary system, the backdrop nature, of initiation. It isn't a stone step, an experience, per se. 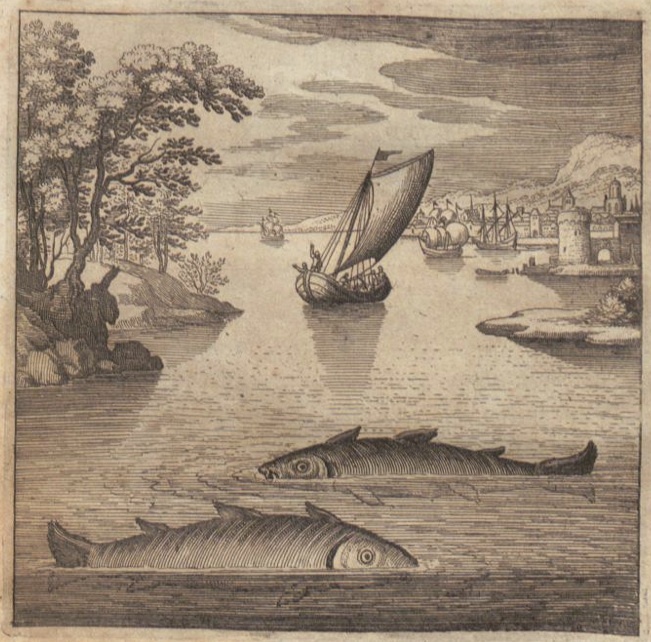 The imagery of stone is now indicating that something quite real has materialized as opposed to the text at the beginning of our journey particularly highlighting the two opposingly swimming binary fishes "without any flesh or bones". I also want to identify here that successful initiation brings about a state that is best characterized by a completely different way of life (as opposed to the uninitiated state). In a real sense then, the initiate isn't operating or influenced by survivalism of the binary system. We're shown, instead of the two opposing fishes, only one. Clearly a direct indication that this king is beyond the binary system; the war of inner duality is no more. In the text, he's called, "Lord of the Forests," a reference to the fact that he emerged from the unconscious victorious. In other words, he didn't turn away from initiation, he didn't get lost in fear (viz. poison), confusion or denial, he didn't become inflated (ego's tendency for narcissism) and he uncovered the secret of how to pass the guardian of the binary, the dragon. 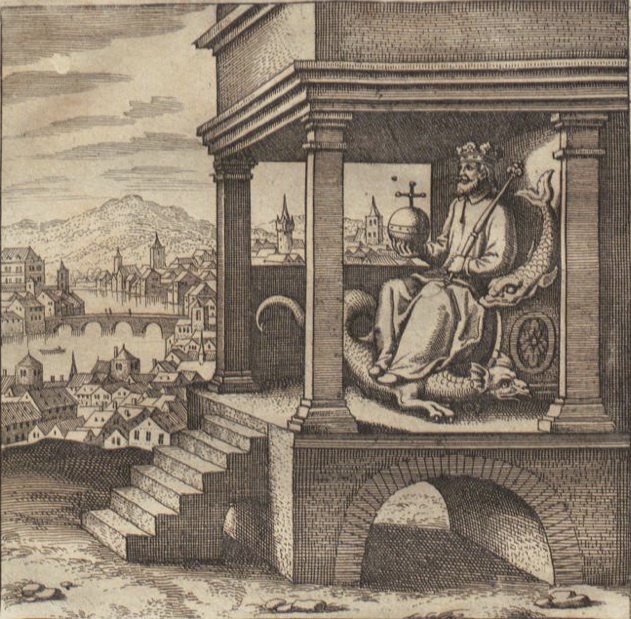 He is holding in his right hand globus cruciger (Latin, "cross-bearing orb") symbolizing dominion over the binary world. In his left hand, a staff. The staff representing the higher will of the one holding the staff. On the stone throne you'll notice an image of significance, I'll let the reader fill in the blank on this particular item. Have we seen this symbol elsewhere, earlier in the work? His foot now rests comfortably on the dragon which the sword-wielding initiate encountered in Figure II. The mental transformation has taken place from a fierce, warlike intent to submissiveness. The aspect of submission, surrender to a higher purpose, is a critical element in the advanced path of illumination. All initiates will have a choice: either return to inner war in the binary (by rejecting our Higher Self) or become a royal servant, a humble master to the Higher Will. It may be said that this Figure likely will represent the most daring of interpretations in this sequence of the initiatory process. A salamander is clearly engulfed by fire. A semi-naked figure, not of the usual consistent caricature of the initiate, is shown. This simply refers to the fact that this image is attempting to identify a particular state. He's semi-naked. (Most likely he would be naked if it wasn't for the heavily influenced Christian theme throughout this work.) His hair is cut short as opposed to the initiate's shoulder-length cut. Ornamentation is upon both of his legs. A decorated rose is upon the rope around both legs. 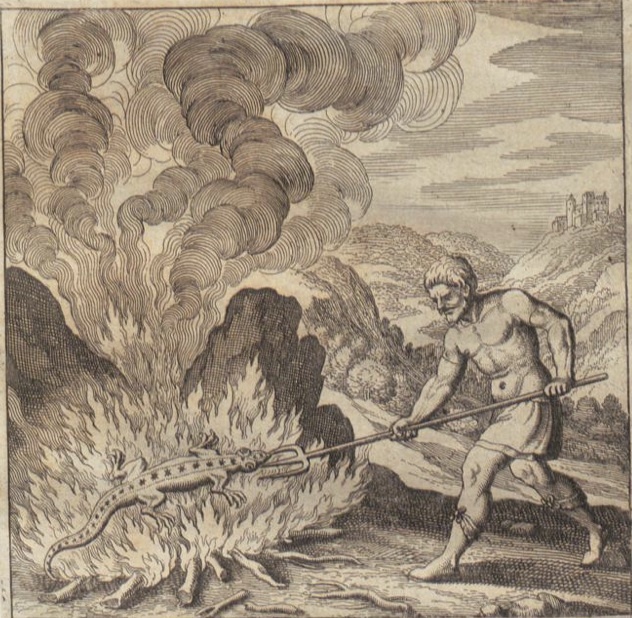 Saturnian spear in hand, he is stoking the fire. Smoke is rising as this fire "imparts to it a most glorious hue" (quoting here from the translated text). Properly understood, this particular stage in initiation (as a prelude to the next, Figure XI) highlights an energy state, a heightened raising of frequency. An accelerated state allowing the initiated one to be open to the "invisible forces". This motif we encountered in Figure I briefly. An initiate must surrender to the realization that there are invisible influences in life, much like the sailboat is propelled by the invisible (yet felt) wind. An alchemist of the lab will quickly realize the energetic effects (described here) also present when ingesting 'a firestone' that has been alchemically prepared. In other words, elixirs prepared in the lab and then ingested can be similarly experienced as would the effects of advanced initiation in inner work. When seen from this context, it is no wonder that throughout the history of alchemy large volumes of symbols could be interchangeably referred either to lab-work or to inner work. As a result of successfully raising his frequency and having enabled the initiate to experience higher worlds, or simply stated, purified the dross body, a door opens onto the left side of the river. We're referring to the initiate because, in the background, a sailboat is also observed. From having undergone this accelerated state, the initiate now born new of this experience, cements this as an intellectual insight (symbolized by the appearance of a large castle on the left shore of land). No more theory needed, the experience says it all. Notice that the initiate isn't holding the staff. At this point in the process of initiation, the initiate hasn't attained what the symbol of the staff represents. He's hand in hand with his Higher Self on one side, and the Guide on the other. This speaks to the reality that the Guide's purpose in initiation is to place the initiate in the hand of his Higher Self. At the heart of initiation, the Guide plays a crucial role in leading the initiate to Higher Ground. The symbolism of a mountain speaks plenty of folklore and mythologies characterizing the meeting place of Heaven with Earth. While generally we see ladders, ropes also depicting the concept of ascension (i.e. Rosenkreutz’s Chymical Wedding), herein, in this work, we are to understand that the change in frequency is ignited from no other place than from within. We were given this clue in Figure X. From this rare vantage point, equal to the footing of the Guide, the initiate is able to see from 'above', the landscape of 'below' (to use an often butchered concept in alchemy). Both the right hand of the Guide's and of the initiate's point downward while their left hands point upward. We're also mindful of the reality that the word "manifestation" derives from the same root as 'manus', the Latin word for "hand". So we're taught again that 'what is above, is (manifested in) what is below', shown by our Guide. To explain this in the context of true initiation, a rarely discussed insight, an authentic spiritual purpose does not originate from the lower will, the ego. If it's unadulterated, then the purpose (i.e. directing what the initiate does or doesn't) will manifest from Above, from Higher Self. There's a sense of harmony in this perception, symbolized by the sun and the moon being in equal ratio to the mountain top. Another observation to point out here is that gone are the days of the wilderness. In the background, we see towns and small castles. Birds are in flight, representing a boundary between the mountain top and the world below. Only successful initiation can help the initiate cross that atmospheric boundary. Springs to mind yet another butchered Christian aphorism: "In the World but not of the World". This particular image in the sequence of this alchemical initiation is representative of a major breakthrough. It would make sense employing only the philosophy of Christianity that this choreography of an event be misleadingly described simply as 'father eating his returning, prodigal son'. Freud would also be proud of such psychoanalytic interpretation, no doubt. My interpretation would reveal otherwise especially when examined under the light of true initiation. In Figure XII, we discovered that the Guide introduced the initiate to Higher Knowledge. While this would be sufficient for a purely intellectual initiate as a mark of success, there's more to the story here … the most difficult decision befalls our initiate now. That is, to be in complete servitude of his Higher Self or not. Are we to live our Higher Will, what some would call spiritual purpose, or not? 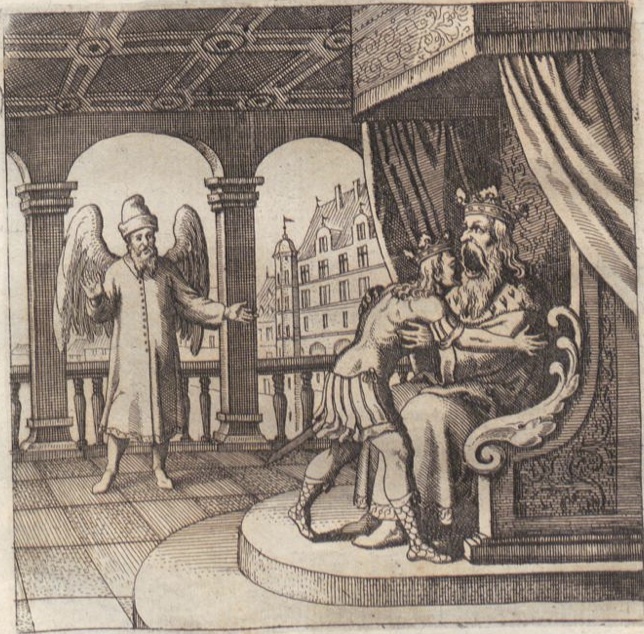 While the winged Guide is physically present (making a hand gesture equivalent to the previous scene, "As above, so below"), it also points to the king (Higher Self) swallowing the initiate. The reality of the ego to be either inflated or in denial, and largely self-centered, comes to an end and the Higher Self then "absorbs" the lower self (initiate). In 16th century thinking, the caricature of a father eating his son is masterfully expressing this notion in this particular image. Meditative, we find our transformed initiate. Now a king of rebirth, reflective and digesting what he inherited (his lower self, the son). While the Higher Knowledge provides a perspective no uninitiated can comprehend, it also comes with responsibilities that makes our initiate troubled, twisted, recoiled, and heavy of heart or as the text points out, "father sweats profusely". You'll notice that the bedsheet is twisted around the two bedposts. If there was a modern dialogue for this image, it would surely read: "O God, what have I done; what have I signed up for?" Such dramatic visual depiction of the emotional state of our initiate, perplexed within (for what he realized), is used plenty in this sequence of alchemical work. There's another aspect to this image that I am uncomfortable discussing here. It's best left for those initiates who will reach this stage of initiation. Let us just say that it is concerned with a certain realization. This Figure XIV could easily be called the true testament of the character of an initiate. Will he (or she) surrender to a Higher Call? It should also be stated that proper initiation is primarily about connecting the initiate with their Higher Self. So I ask, would the majority of initiates undertake this journey if they had prior knowledge of what truly awaits them? Doesn't an ego, by definition, resist such initiation? Wouldn't it make more sense that the ego would then want to subjugate their Higher Self? To continually reign large and relevant, to control unto death all he comes across, and to be what we regretfully see as an obnoxious dictator. For this very reason, the aphorism of initiation should properly read as such: 'Many are called, few (willing to listen or) chosen'. We learn here (when analyzed in sequence of action) that the initiate has made his decision. Or, was it that he realized he never had a choice? 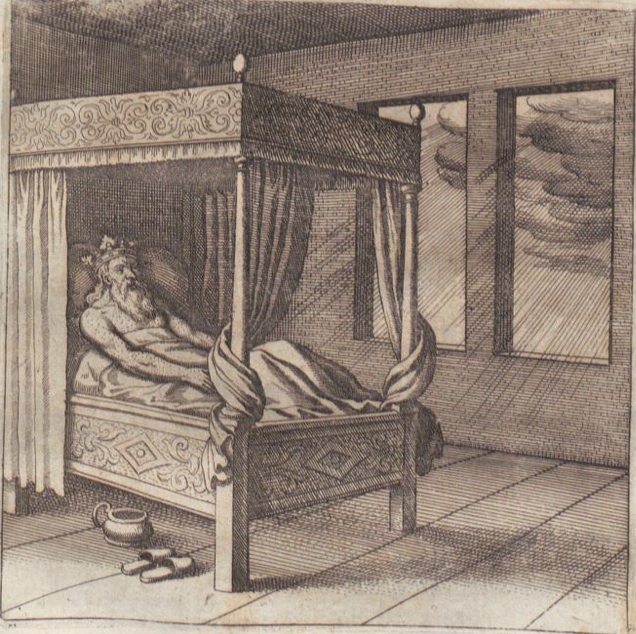 In this particular image, the initiate has risen from his bed and visually is now seen sitting on par with his Higher Self. He has also received the staff, representative of Higher Will. I found it especially rewarding to see that the Guide's left hand is still pointing towards the Higher Self. The life of a true initiate isn't always rational. It doesn't have to be. For it is about a sail opened; a ship journeying within a spiritual system that's based on what the old masters called "revelation". So is the nature of the inner work. The winged Guide (symbolizing higher insight) is situated in the center for without an experienced Guide, an initiate would not be able to undertake this initiatory journey. You'll notice also that behind the three figures a bed sheet is suspended and hangs on two pillars. This detail draws upon, yet again, an action similar to that of ripples on the face of a pond created by the impact of an object. This symbolism is characteristic of phenomena associated with the emanation of God, in old times. Christian-heavy symbolism abides here. If we compare the detail of the bedsheet to the previous image, Figure XIV, where it is drawn twisted around the two bedposts, we see an interlocking of this idea. Figure I can traditionally be seen as a description of the nature of reality. It also characterizes in detail the various aspects of the internal dynamics of the initiate. All seven stone steps (or could be referred to as initiatory insights) from Figures II to VIII lead to the throne, Figure IX. These seven revelatory images show various action scenes. They feature in trademark form, generally, two animals to show the dynamics of the binary system and the learning that can be had. The five images XI up to XV can be referred to as various aspects of higher knowledge, will, or purpose, and of course as the relationship with Higher Self. All initiation is the intent of taking the initiate to this potential relationship. That's why we have referred to this notion as "unmanifested potential" under Figure I. Figure XV is the concluding image depicting the completion of initiation. All three of the “participants” are sitting down symbolizing that the initiatory work has no further movement. This particular image refers mainly to the work depicted here in the “Book of Lambspring”. We know from experience that The Great Work is accelerated now and will depend on the level of commitment of the initiate.